The reed switch is an electrical switch operated by an applied magnetic field. It was invented at Bell Telephone Laboratories in 1936 by Walter B. Ellwood. In its simplest and most common form, it consists of a pair of ferromagnetic flexible metal reeds contacts in a hermetically sealed glass envelope. The contacts are usually normally open, closing when a magnetic field is present, or they may be normally closed and open when a magnetic field is applied. The switch may be actuated by an electromagnetic coil, making a reed relay, or by bringing a permanent magnet near the switch. 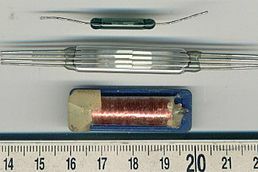 When the magnetic field is removed, the reeds in the reed switch return to their original position. The reed is the metal part inside the reed switch envelope that is relatively thin and wide to make it flexible. It somewhat resembles part of some reed plants. The term "reed" may also include the external wire lead as well as the internal part. An example of a reed switch application is to detect the opening of a door, when used as a proximity switch for a security alarm.